The history of our fair mansion has been interpreted in many fashions over the course of the years. This house has seen many changes in appearance over time as well. Most of us are familiar with these changes, and have seen a model, or painted a picture in our minds eye. The house as it stood in the 17th century is familiar to us, as is the restoration taken up by our founder Caroline Emmerton and her architect Joseph Chandler. Although it was Hawthorne’s work that immortalized this house, we have only heard of the changes made by Capt. Samuel Ingersoll, and the appearance of the home when Hawthorne visited. What he saw in his time was very different from the structure with which we are so well acquainted today. 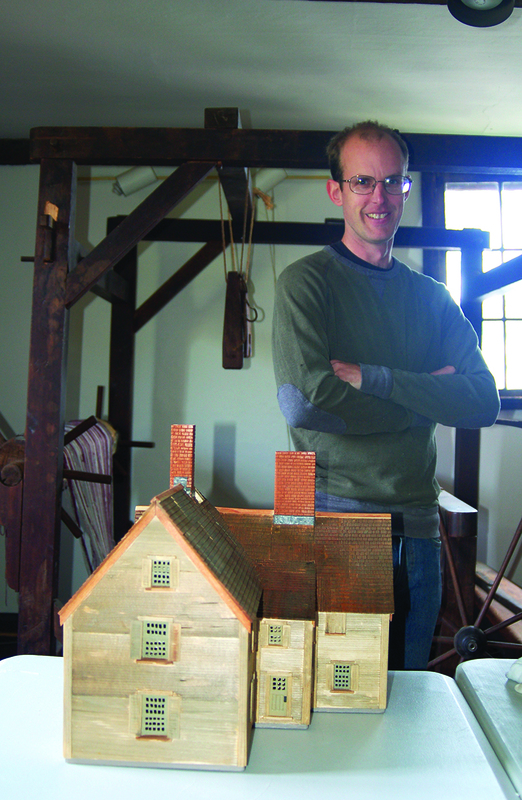 Now, the House of the Seven Gables is in the proud possession of a model depicting the house as it stood when our native author visited his cousin Susannah Ingersoll here. Over the course of the past few months, our very talented employee Brian Payne has created this model. The end result is quite impressive. Superior attention has been given to every detail and its properly scaled proportions have been derived from blueprints in our archive. Although the blueprints did provide correct dimensions for the structure itself, additional information was required to accurately portray the overall appearance of the house at this time. It is our good fortune to have at our fingertips a wealth of knowledge in the hands of our fellow employees, many of whom are passionate historians in their own right. Such is the case with Everett Philbrook who manages the museum store. He is in possession of a rare photograph that shows the house circa 1858-1860, and was instrumental in providing much detailed information from his own knowledge that was a great asset to this project. It is our hope to have this model on display for the visiting public in the near future. It is an excellent piece that will enable us to convey an important aspect of our architectural heritage for many years to come.